This post talks about the complete process to factory reset android tv box, so that you can experience a completely new tv streaming box, each time. We always need tv boxes to function efficiently, since our life has now depended on this tv box to satisfy our entertainment needs. But, sometimes not everything go as per planned, and like any other electronic gadget, our android tv box also shows sign of crashing Kodi, buffering or freezing during streaming, error while opening apps, sluggishness etc. This kind-off puts everyone off. Like every other device in our house, our set top box also needs periodic servicing and clean-up. And, by resetting the android device is most crucial and very simple aspect that will make our tv box unit function like a brand new box. Resetting an android tv box may seems very easy, but sometimes if things aren’t performed in the correct order, then cases of problem may arise. You may loose your data completely, or render your streaming box useless. Every android boxes come with the standard instructions manual to help performance such tasks easily. People scramble for help online, but the actual steps are available in these guides. Ensure that you start referring to the user help, before you proceed with the steps to reset your android tv box. The section we will talk about next will guide you through the entire process in factory resetting your android tv box, so that your device runs more faster and quicker, and consumes less amount of power supply, without any heating issues. Typically a factory reset deletes any apps, settings, or customization/configuration done on your android tv box. It ensures that it reinstalls every thing back in place, at the time of inception of the android device. Just like a factory new piece. 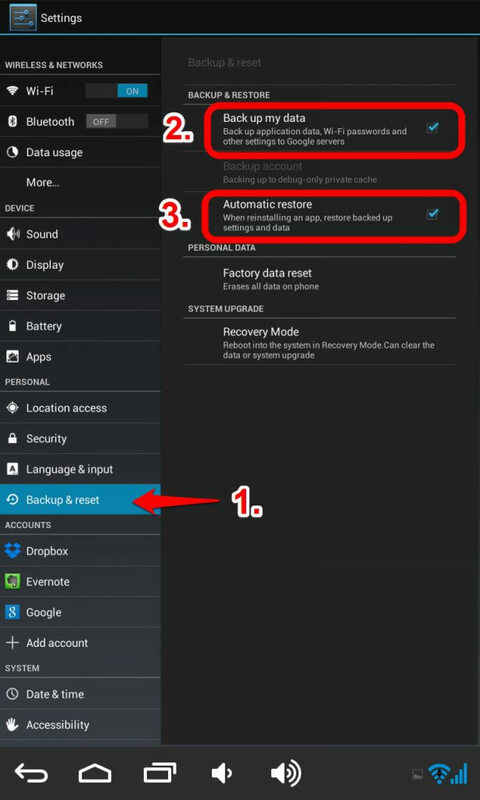 Before you begin with the factory reset process, look at below steps and make a backup of your android box. This will help in restoring data, when the factory reset occurs. 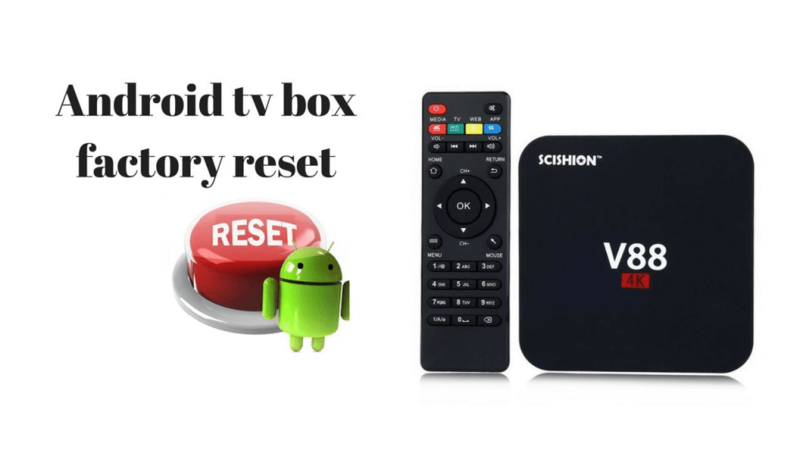 How to do a soft factory reset on your Android Box? The process of doing a factory reset on your tv OTT device is very simple and straightforward. The following steps are very generalized and can be performed on any tv box, respective who the manufacturer is. The process for everyone is very similar and common for everyone. Go to the Settings menu. This should be at the application Home screen, that resembles the cog icon. On the Settings option, select the Storage & Reset option. Next, select the Factory Data Reset option. You can also view the Internal Storage from this setting. Here, you will find many options, depending on the make of your tv box, such Fast Reset, Full Reset, etc. Simply, select Full Reset or any option that resembles this option. In the next screen, you will receive a prompt to verify that you want to go ahead with the process of formatting your tv box. Click OK to start the process. The entire takes about good 5-10 mins, depending on the storage capacity of your android tv box or on the time, when you last formatted your tv device. Android TV box with storage capacity above 32 GB, will take time to complete the entire factory reset process, approx. 15 mins. After the tv box finishes with the reset process, your tv box should be able to run very quickly and much more efficiently than it was before. You can also check if you were experiencing any occasional freezing or app force stop, this should have been gone and now resolved. How to do a hard reset on your Android Tv Box? Somtimes, a soft reset cannot solve a problem in cases where your software itself has got corrupted, or you cannot boot your android tv box. This makes your android tv completely bricked and unusable. But fear not, we have a solution to your problem and to completly unbrick your android box and make it run like new. The option to your problem is by performing a hard reset. A hard reset is also performed, in case you have updated the firmware of your android tv device. Only perform this reset on your android streaming device if your device is new and not under warranty. If it under any warranty, kindly take it your manufacturer for fixing and repair. They will do the job for free. Before you can start, keep a toothpick handy, or you can use any other pricking element, just ensure that the pricker is non-conductive. Also, keep a usb keyboard and mouse handy, cause the IR remote may not respond properly, when your system is down and out. Turn off your android box and disconnect the box from the power source. Look at the back of your device, near the AV port. You will find a small hole. Use your toothpick and gently tap the button in the hole. As soon as you press the button, you will realize that the button is depressed. Keep the button down, now connect your tv box, and power it up. Do not release the button. Keep holding the button, until the android logo is shown on your TV screen. As soon as the logo disappears, release the button from the toothpick. You will be booted into the start-up screen. Now, use your android USB keyboard, and select Wipe Data or Factory Reset option. Press tab on keyboard and select Delete All User Data option. Press tab again to confirm the process and wait for the device to complete the process. After the reset process is completed, select Reboot device option, and again hit the Tab key to confirm the selection. Allow the device to restart. Now your android tv box should be renewed with more power and be more fluid in its performance and efficiency. You can go about installing the apps on your tv box again. Steps to Update Kodi. Note the hard reset feature just removes the apps that you had installed earlier and keep the system apps in their default condition, with the default settings. How to Factory Reset Kodi on your android Box? Factory resetting the Kodi app is very easy. Before you can go ahead with the process, ensure that you do a backup of all the addons installed in Kodi. Refer, Backup/Restore Kodi Addons. This will help prevent any data that is being deleted during the entire process. Ensure that your are not running Kodi. From the Recent App, force close Kodi app. Next, go to Settings > Applications. Find the Kodi app from the list. It is recommended that you click Force Stop to ensure that Kodi is not running. So through this post we have successful shown you the steps to reset your Android tv box and also a brief description of resettting your Kodi app. We hope that the above steps should be able to solve your problems faced on your tv streaming box and your kodi app.